3LAB's Guide to Luxury Living: 3LAB featured in the New York Times!!! 3LAB featured in the New York Times!!! EXTRA! EXTRA! READ ALL ABOUT US...IN THE NEW YORK TIMES! T Style Magazine in their huge story on skin brighteners. 3LAB Perfect "GLOW" Complex -Inhibits tyrosinase activity and reduces the transfer of melanin for more even toned skin that glows with clarity and radiance. Erases the signs of skin damage including age spots, sunspots and acne marks. 3LAB "M" Cream - A sumptuous, gel crème that brings stressed skin back to life. “M” Cream hydrates and firms the skin with Nano-Claire GY, the world’s first bioengineered growth hormone. PhytoCellTec™ Malus Domestica, stem cells from a rare Swiss Apple that have been proven to slow down and delay the aging process. Happybelle, a plant-based beta endorphin, stimulates key enzymes in the receptor system helping to relieve skin aggressors and bring out natural radiance while fighting the root causes of environmental damage. Also contains Osilift which immediately firms the skin and relaxes muscle contractions. 3LAB Perfect Lite Sunscreen SPF 30 - Sun protection lotion clinically proven for effective SPF level 30. Made with advanced Micronized Titanium Dioxide. Provides up to 30 times the protection to the bare skin and physical barrier against UVA/UVB and infrared rays to prevent sunburn, skin damage, freckling and uneven coloration. 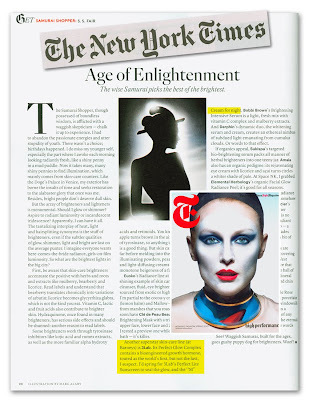 We LOVE the New York Times and are HUGE fans of the Samurai Shopper column. It's smart and very well researched and written. Thanks so much S.S. Fair!!! We're thrilled!